The sitter has been misidentified as Julie Le Brun. Helm even catalogued the painting as the portrait of the artist's daughter sent to the Paris Salon of 1798. A copy was thought to represent Countess Irina Ivanovna Worontzoff, nee lzmailoff (1768-1848), and its provenance was given as the Worontzoff estate of Alupka in the Crimea (sold at Sotheby Parke Bernet, 1977, see below). Vigee Le Brun accounts for two "busts" of "La comtesse de Worandsoff" in her Souvenirs. One such portrait, signed and dated 1797, shows the Countess seated at a desk reading a play by Racine (illus. in Nokolenko, 1967, p. 115, no. 14). In 1905 that work was still in the Worontzoff-Dachkoff collection, Moscow, but subsequently has not been traced. Until it is rediscovered, no determination can be made as to whether the portrait in Boston represents the same person. The young woman is depicted with her arms crossed over her bosom and firmly ensconced in a shawl. Set against a cloudy sky, she wears a high-crowned straw bonnet topped with a plume and held in place by a muslin scarf. Her dress is of dark green silk. 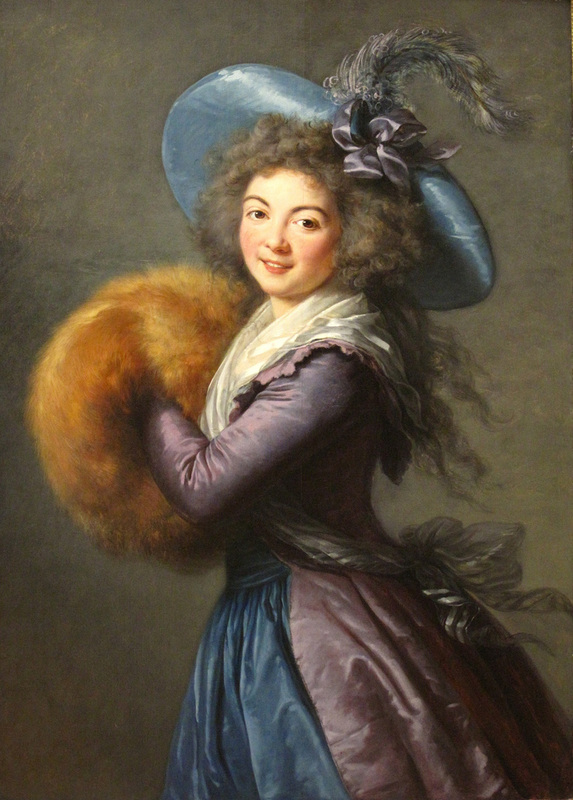 The color scheme is low-keved, but as usual Vigee Le Brun adds a contrasting touch of brilliant red on the edges of the shawl, the scarf, and the cockade. The unattractiveness of the face is compensated for by a clever mise - en - scene: the sitter is portrayed in motion. The artist reverts to a composition which had proved highly successful in prerevolutionary Paris. 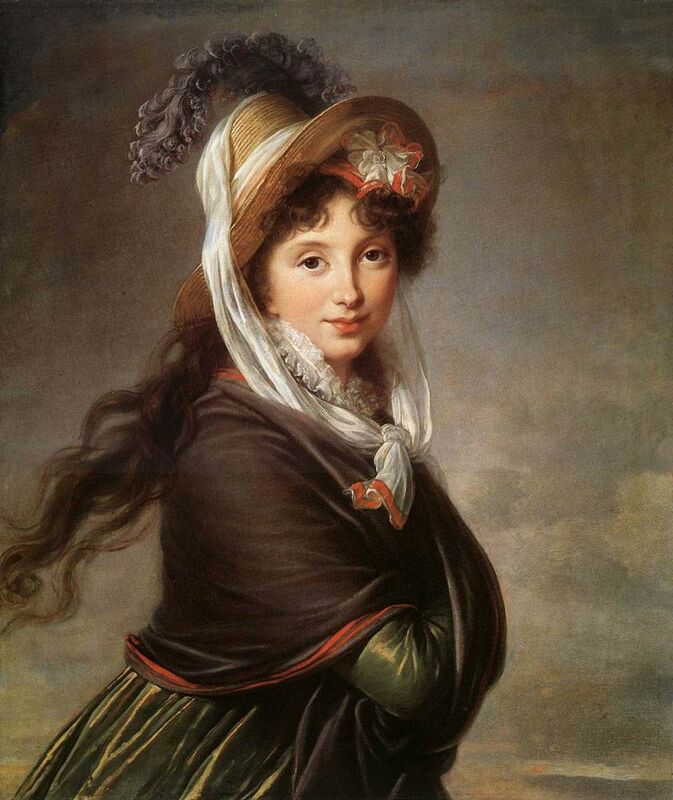 The stance repeats in reverse that of the actress Mme Mole Raymond in one of Vigee Le Brun masterpieces (fig. 39). The pose also occurs in the 1797 portrait of Grand Duchess Anna Feodorovna (formerly in the Herzoglisches Museum, Gotha, but destroyed in World War 11; illus. in Nikolenko, 1967, p. 111, no. 37). A small copy with a background of trees, possibly the work of Auguste Riviere, formerly in the Worontzoff, Kotzebue, and Metter - Zakomelsky collections, last appeared in the Sotheby Parke Bernet sale, new York, October 28-29, 1977, lot 249 (see above). Another was formerly in the Arman de Caillavet collection, paris (illus. in C. Saunier, "La Collection de Mme A. Arman de Caillavet, Les Arts, No. 62, February 1907, p. 17). PROVENANCE: Eugene Kramer; his sale, Paris, Galerie Georges Petit, May 5-6, 1913, lot 50; E. M. Hodgkins; Robert Dawson Evans, Boston; given by his widow in 1917 to the Museum of fine arts, Boston.